On a train ride from New York to California, Disney drew the character that would launch his new studio: a mouse called Mortimer. His wife Lillian objected that the name sounded too stuffy. She suggested Mickey. A midwestern cartoonist brought the world Mickey Mouse and Disneyland, and founded an entertainment empire. Disney was born in Chicago in 1901. He began drawing at a young age and spent his time in school sketching flowers and trees instead of studying. When he went to France as a Red Cross driver toward the end of World War I, he drew cartoons in his off hours. Returning to the States, he found work in a Kansas City advertising agency and then founded his own company with a colleague, Ubbe Iwerks. The two soaked up Charlie Chaplin's movies and taught themselves how to create animation. Like many others in the 1920s, Disney soon was seduced by the new movie mecca, Hollywood, and he moved to California with dreams of success. Along with his brother, Roy, he started a small animation studio and cajoled his friend Iwerks to join them. On November 28, 1928, they premiered "Steamboat Willie," the cartoon that introduced the universally appealing Mickey Mouse to movie audiences and was also the first to fully incorporate synchronized sound. The cartoon mouse's adventures buoyed Americans through the Great Depression, and kept Disney's business afloat. In 1937, the studio released its first full-length feature,"Snow White and the Seven Dwarves," which had been financed by A. P. Giannini's Bank of America. The feature was a blockbuster hit, though the studio struggled financially. Disney kept trying new things. He and his crew built a pathbreaking "art on animation" camera, patented in 1940, that gave their drawings the illusion of depth. The camera was used to shoot the various layers of background and foreground imagery that were needed. With up to five planes of movement and static scenery, depth of field was created. In 1940, the studio released a tour de force called "Fantasia," combining animated characters with classical music. It had required a production staff of 1,000 people, and lost money at the box office, but became a landmark in film history. In 1947, Disney branched out into nature documentaries with the Academy Award-winning "Seal Island." His second film in this vein,"The Living Desert," earned $5 million, ten times its production cost. In 1954, the Disney brothers negotiated a deal with the ABC television network to create a weekly one-hour program and to become partners in Disneyland, an amusement park Walt wanted to build. Half of the television viewers in America tuned in, making Disney's show a huge success. The program created an instant coonskin-hat fad when it aired the story of Davy Crockett. After 1955, when Disneyland opened in Anaheim, California, Disney's income skyrocketed. "What we're selling," he would tell an associate,"is the name Walt Disney." 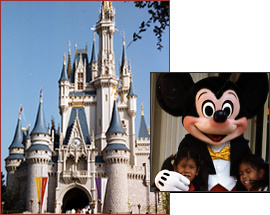 By the time of his death in 1966, Disney's name had become synonymous with family entertainment.